The Journal of Pain Management is a peer-reviewed journal published by Nova Science (New York) aimed at the scientific community interested in pain management. This multidisciplinary journal aims to provide a medium for research and reviews that will influence clinical practice in contemporary pain medicine with an emphasis on applied research. The journal welcomes submissions from all disciplines working in any area of pain management including acute, chronic or cancer related pain. The editorial board is interdisciplinary representing specialists working in the field of pain. The Journal welcomes and encourages submissions from all disciplines including medical specialties, basic science, psychology, nursing, physical therapy, social work, physical therapy, occupational therapy and other related fields. 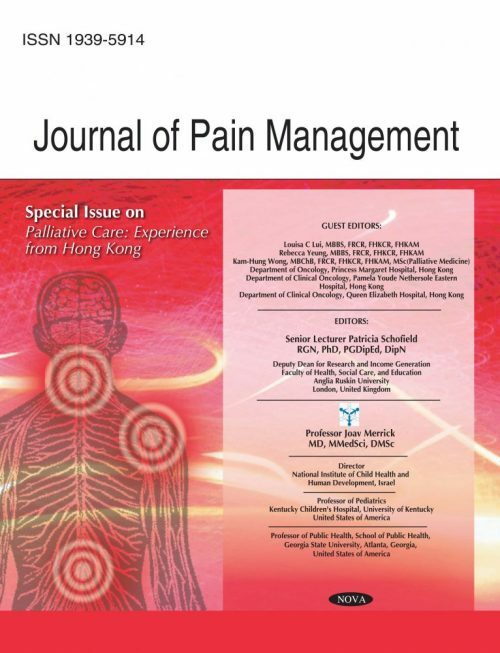 Journal of Pain Management is a peer-reviewed journal that publishes four issues per year. The journal is owned and operated by Nova Science Publishers and funded entirely by subscription revenue and author-optional publication services. All abstracts and articles must be written in English with references in standard Roman script. Make sure that figures and tables do not contain any reference to author affiliations. Choose file names with care, and ensure that the file’s “properties” are also anonymised. If you are using Office 2007 or later, consider using the Document Inspector Tool prior to submission. All references should adhere to the Vancouver Reference Style, as recommended by the International Committee of Medical Journals Editors. A maximum of 25 references should be used for articles, 40 for review articles, and 5 for case reports. They should be cited consecutively (enclosing the number in parentheses) in the text and listed in the same numerical order at the end of the paper. Blind peer-review and publication decision are carried out and made by the Editor-in-Chief in cooperation with the Editorial Board.